If there is anyone who knows a little bit about stress, it’s a bride to be. Seriously, they can get downright c r a z y. Which is why we thought it was a wonderful idea to have such a person (a bride to be, not a crazy person) review our new book, There’s An Adult In My Soup. Enter Becky Speer, aka Becky Mochaface, whose big day is quickly approaching. Would she actually find some value in it, or toss it aside like a wedding DJ with nothing but Chicken Dance CDs? Since reading this book, I’ve noticed how many times I want to answer “How are you?” with “Busy.” It’s not really an answer. We’re all busy. And it doesn’t even describe how I’m feeling at that particular moment. Now, I take a deep breath and answer with an enthusiastic, “I’m fantastic!” Because I am. There’s so much in my life to be thankful for. And all of them make my life fantastic. 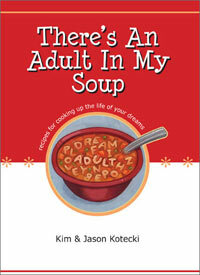 There’s An Adult in My Soup is a great book for reminding you to stop and be in the moment. To enjoy life. And find what will bring you joy. Plus it’d make a great present for just about anyone for this holiday season. Whew. That rocks harder than an 80s metal band. We are quite pleased to have passed this test, and couldn’t agree more about her whole “this would make a great present” thing. Brides to be are really smart. Thanks for the nice review, Becky, and have a awesome wedding day! Meanwhile, have YOU had a chance to read the book? We want to hear what you thought about it, whether you’re engaged, married, or purple. Write your own review over at Amazon.com and we will be forever grateful! I too am fantastic in life!! Thanks for the reminder, Jason of Jason & Kim. No matter how busy we get, we are truly blessed to have all the wonderful things and peeps in our life — peeps being the number one thing, of course. I bet your book is a great as you! And um, I live for the Chicken Dance. Is that weird? No, we’re glad YOU liked it! Hope the rest of your planning is smooth and stress-free!